A surge of warm air will bring temperatures back to the low 60s this afternoon, along with rain and some thunderstorms. A strong storm system over the Midwest will keep our weather active this Wednesday. The early morning radar shows a band of showers (and a few lightning strikes) lifting into western New York. This will actually dissipate over the morning hours, with just a few showers expected across the Finger Lakes. A second area of showers and thunderstorms will develop along the warm front. Temperatures will rise into the upper 50s and low 60s just ahead of the precipitation. Areas further east will have more time to warm, and thus have a high chance of seeing both 60s and thunderstorms. Severe thunderstorms are unlikely, but a little small hail or some gusty winds cannot be ruled out. The rain and thunder should begin to develop across western New York during the early afternoon hours and will spread east through the middle of the afternoon. By 5 or 6pm, most of the thunder will be east of the Finger Lakes with rain and showers lingering behind. These showers will taper off by the evening, with just a few scattered showers possible through the overnight. 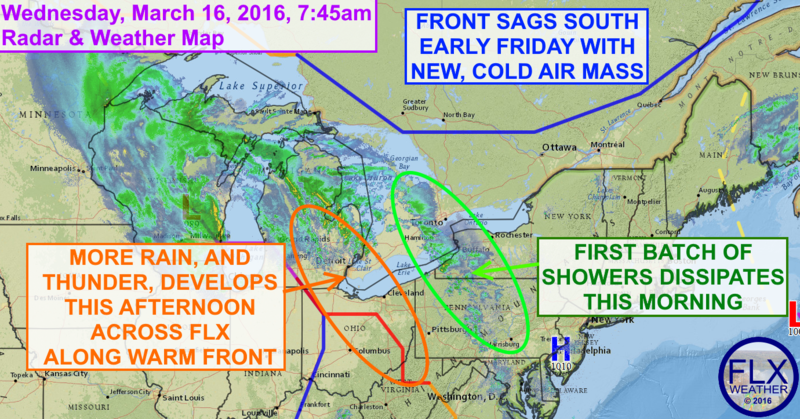 A cold front sitting over southern Canada will gradually creep south. After a dry Thursday morning, this front will help trigger scattered showers and a few rumbles of thunder Thursday afternoon. Colder air will work in late Thursday night and Friday with widespread rain showers, some of which will mix with or turn to snow. After highs in the 50s on Thursday, Friday’s temperatures will only reach the mid 30s. Saturday will be colder, with morning lows well into the 20s and highs in the low 30s. The good news is that much of the day will turn out sunny. The storm potential for Sunday is looking less and less as the weather system in question may just head out to sea. Some sun may warm temperatures into the low 40s instead on Sunday. Colder air will get pulled back down into the Finger Lakes behind that system, with 30s for highs Monday with some lake effect snow showers. Low temperatures from Saturday morning well into next week will be in the 20s, and some areas may even fall into the teens. This may cause problems for those with agricultural interests that already are seeing buds.